Promote Innovation -make Congress do what it pushed off on the Federal Reserve. Recent news 26 July 2018 - President Trump Scores with Fed Tweet - No doubt I would like those that voted for the President, to vote me in to Congress. Having Mr. Trump pick up a my warning is a good first step. It is even better when a reputable news agency reinforces what I have been telling people for 30 years. See Mr. Bove's assessment of how the Fed works within his article "Trump poised to take control of the Federal Reserve" note the similarities to the warnings I wrote in this article two years ago. Executive Summary: Money is a tool whose sole purpose is to make it easier for people and businesses to trade goods and services. When the Federal Reserve raises interest rates they do it to make it impossible for your boss to offer you a raise. Your current congressman will tell you he wants people to get good paying jobs but then he doesn't object that one of the Federal Reserves mandates is to stop wage "inflation". The mission of the Federal Reserve needs a redefinition that focuses more on making sure trade happens effectively and efficiently instead of the current obsession with keeping inflation low. As implemented over the last several decades Fed policies have stifled innovation, degraded the middle class, and increased the wealth gap by providing an unnatural systematic advantage for unproductive companies allowing them to acquire the fruits of entrepreneurs for pennies on the dollar. The Fed should not be the agency making the decisions that drive companies out of business. If inflation becomes an issue Congress can solve the problem of too much money in the economy by using the tax code. When solved through the tax code entrepreneurs and small businesses can be promoted instead of taken advantage of by bigger corporations, people get paid enough to get out of poverty and the country collects money to pay off the national debt. Read and head the article below and tell your congressman he needs to implement my corrections or you will see more articles like "Why is the Dow plunging" over the next couple years. The mission of the Federal Reserve and the tools it has to complete that mission need a major redefinition. The primary mission of the Federal Reserve should be to make sure the money supply promotes efficient trading of goods and services between individuals and businesses. Another objective is to help with the national debt by securing for the United States Treasury the lowest possible interest rates. A tertiary mission would be to provide recommendations to the Congress on tax rates and implementation. The way the Federal Reserve currently implements monetary policy promotes large corporations over small business and stifles innovation. In this article I argue against the generally accepted Fed practice of using monetary policy to fight inflation. There are multiple reasons I believe the Fed needs to get out of the business of trying to regulate inflation using monetary policy; One reason is because the method they use to is to raise interest rates and raising interest rates is counterproductive to paying off the national debt. A second reason is because when inflation is caused by the products we use no matter what the cost (such as gasoline) the method doesn't ever work. Most importantly though it often rewards complacency and waste in larger corporations while preventing innovators from access to the money they need to make their business successful. The economic theory goes like this: Whenever you have too much money flowing around people start bidding up the price of items causing inflation. If the government makes some of the money unavailable the reduction of available cash will make it so people can not bid up prices. Policies championed by those that are a fan of the current Federal Reserve result in the transfer of assets from small business enterprises to large corporations. In periods when the economy thrives entrepreneurs and inventors start businesses and often come up with improvements to existing products or ideas that could replace standard equipment. These innovations will cause a competition for resources between the small business and large corporations. Fed Fans believe this competition will lead to inflation so in order to stop the perceived threat they advocate reducing the amount of money available to make loans. In the process for gaining bank funding the large corporation has the competitive advantage over the small business. The result is the small business ceases to operate and either the innovation never gets adapted or the corporation buys it up at pennies on the dollar shutting out the innovator from receiving the just benefit from his or her efforts. Not only do the innovators not get the benefit of their innovations, this is bad for the country as well. Not only is the country missing out on having many of these products come to market but future generations of individuals don't have the inspirational stories that make our children want to strive to become entrepreneurs and create the innovations that can continue to make the United States the best place on earth to live. Promoting the innovator can not be done by restricting the money supply by raising interest rates. If there is so much money in the economy that it is causing inflation then it needs to be taken out of the economy in a more targeted manner. This is Congress' responsibility and they do this through the tax code. Taking money out of the economy through the tax code would not only prevent inflation it also brings in more money to pay off the national debt. This is a win / win situation for the Country. Right now this Country relies on the Federal Reserve to control inflation by stifling innovation. It's time to change this and demand Congress step up and do its job. I am willing to do the work the Constitution says is a Congressional responsibility. Please help publicize my campaign for congress. The rest of the article discusses why raising interest rates doesn't stop inflation when inflation is caused by something everybody has to buy in order to live. And it tells why some people have been fooled into believing its worked before. The years 1979 to 1986 provide a perfect case study to argue against restricting the money supply (promoting higher interest rates) in order to knock down inflation. Around1979 two things happened that caused oil prices to significantly increase. First - speculation about Iran's production capability and second was the deregulation of oil prices. Oil prices rose from around $15 a barrel to around $45 in a very short time. Though it seems common now this was very alarming at the time. Prices for other goods and service adjusted in response. The Fed responded by trying to ring out inflation by driving the prime rate as high as 20%. As a result the government had to pay up to 15% interest on 30 year bonds. This method seemed to have worked because the inflation rate did drop after 1983. However, examination of the nation's money supply shows there was a significant increase in the money supply despite the Feds effort. One can easily argue inflation went down despite the high-interest rates. In this case, inflation went down because oil prices stopped rising. Oil consumption did go down. To me it's obvious consumption went down because oil prices tripled. To Fed fans the reduction in oil consumption rates proves high-interest rates can reduce inflation. Revisiting Fed Fan logic, suppose in the "normal economy" of 1978 a farmer spent $100. Of that $100 he might have spent $15 to buy seed, $35 on farm equipment, $10 on energy (including diesel), $8 on interest, $6 in taxes, and $36 for household expenses. In this simple breakdown of expenses items such as housing, food, recreation equipment (ATV or boats), savings etc all fall into household expenses. Also,other farm cost such as irrigation etc are covered in either the seed or farm equipment categories. With oil prices tripling by 1981 the farmer must now spend $22 on energy cost. In order to do this he must either reallocate funds from one of the other categories or raise more money. Fed Fans believe the natural inclination is for the farmer to raise his price in order to cover the cost. In their eyes this leads to more expensive food. This is inflation. Inflation is bad therefore something must be done in order to convince the farmer not to raise prices. Their solution is to make it hard for the farmer to get a loan. In their eyes this will make the farmer give up the ATV and the boat and self-finance the energy increase. In the Fed Fans eyes, if they can convince the farmer to give up their ATV's then they can stop inflation. The obvious flaw in this logic is that farmers weren't spending 30% of their household expenses on recreation. Even if you make the farmer stop contributing to his savings this doesn't cover the additional energy costs. Also, I'm pretty sure at the first increase in energy costs the farmers decided not to make new recreational purchases. In contrast to Fed Fan logic my logic tells me that raising interest rates does nothing to reduce the farmers likelihood of buying a boat because the higher fuel cost already did that. All that raising interest rates did was increase the amount of money the farmer must come up with in order to service his loan. That is the farmer not only has to raise his prices to cover the $12 energy increase he must also raise his price to cover the $1.50 in extra interest he is paying. Thus, the policy pushed by Fed Fans actually drives up the costs of goods. Now this inflation only last as long as the Farmer stays in business. If the Fed Fans can actually drive the farmer out of business then a bigger Corporate Farm can come in and buy up the farm at bottom barrel prices. The corporate farm gets better finance rates, it bought the farm at the lowest possible price and they probably picked up the equipment cheaper than the previous farmer. With these lower costs some of the inflation pressure is off. Not only that but they can hire people with no expectation of ever being able to afford recreation activities. And remember inflation is a measure of price increase. That is – even if the new corporation keeps charging the higher prices the previous owner implemented before going out of business the inflation rate is zero. So the net result does not include lower consumer prices. The net result is big corporations gain a competitive advantage over the small business operations. In both the farm example and the innovator example the policy put forth by Fed Fans do nothing to reduce inflation but they do stifle innovation and act as a defacto corporate welfare system. Beyond these cost the country also ends up increasing the national debt. This is because the way Fed Fans make money more difficult for farmers and innovators to get is by promising that the federal government will pay higher interest rates. Back in the early 1980's the Fed Fans promoted a policy that resulted in the government paying 15% on 30 year Treasury bonds. What does this mean in terms of the national debt? Well if the government pays 15% for every Trillion Dollars it has to finance we must pay $150 billion in interest every year. If they borrow that money at an interest rate of 5% we must pay $50 billion instead. Now the government never refinances all its debt in the same year so it is wrong to assume that the government pays $700 billion dollars in interest if the current interest rate is 5% and $2.1 Trillion if the current interest rate is 15%. But the government does finance and refinance a large amount of money every year and every percent in interest rate increase significantly adds to the current budgets deficit. That is why I believe the primary function of the Federal Reserve should be to work to minimize the interest paid by the Treasury to service the national debt. I also put in a secondary function of the Federal Reserve and told you it should advise the congress on optimal tax rates. I generally believe the innovation created during periods of high economic growth out weigh the negative of possible inflation. However, I understand people being leery of high inflation. I understand why some people may think it beneficial to take some money out of the economy. I've already shown that doing this by the methods advanced by Fed Fans leads to higher deficits, stifles innovation and lowers disposable income for most people. Therefore, if we are going to take money away from the economy it is obvious we are better served to do it in the form of taxes. Proper use of the tax code will take money out of the economy but instead of driving up the deficit it will reduce the deficit. The Fed can use its expertise to inform Congress when this needs to be done. Making Congress do its job also helps stabilize the business environment. That is because the tax code goes through the legislative process businesses can plan for upcoming changes. This will allow better decision making. For instance the farmer that was doing well in 1978 and chose to splurge on a boat had very little warning the government was going to try and run him out of business. If the government had been forced to take money out of the economy via the tax code it would have given the farmer opportunity to plan better and he probably would have kept his farm. In conclusion, Fed monetary policy needs to stick to ensuring the government gets the best interest rates. The Fed should not be the agency trying to police inflation. Instead, congress should use the Feds expertise to produce logical and appropriate tax policy. 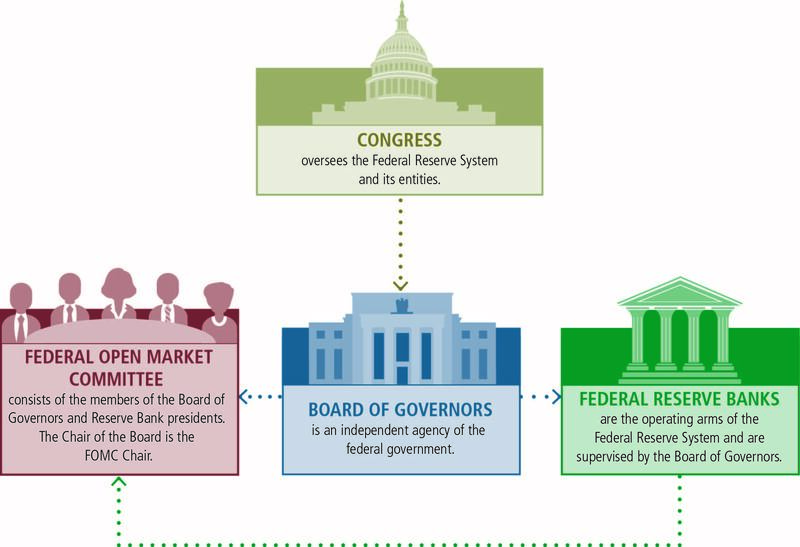 Caveats: Its foolish to think I can sum up and give a full and comprehensive summary of all the complex issues dealing with the Federal Reserve in just 10 paragraphs. For instance, about $2 Trillion of the national debt are held in the Social Security Trust Fund. If the government has to pay higher interest to service the national debt then in theory the trust fund increases by about the same amount. Also, when you hear reports that say the Federal Reserve increased the Fed fund rate, the money that is generated from these transfers goes into the Treasury. This means a person can't conclude that all the money lost by businesses due to rising interest rates vanishes into the atmosphere. When reading and making conclusions about the article above think about it as a start of a new direction of discussion and use it as a call for your representative to delve into the complex functioning of the Federal Reserve. Your representative ought to be able to write or at least identify articles and books showing he understands these functions. I think I should be willing to go on the record showing you the depth of knowledge and understanding of a subject and the possible direction of future investigation. I start that here in this article. In my opinion, this is a good start and more than most candidates are willing to commit to. However, this article is not as complete or comprehensive as I would expect from a person given the responsibility of making decisions on behalf of the people of the 8th district. My desire is for it to convince you that once you chose me to graduate from the citizenry to your representative, I am capable of investigating and understanding the complexities better than others willing to step forward and assume the responsibility of being your representative. Please help publicize my campaign. Word of mouth is great as well as sharing my web page. I do have some Elect Tom McMasters car magnets and a few yard signs. I expect that I will pay for door hangers so if you would like to volunteer to walk your neighbor that will go a long way in helping the campaign.